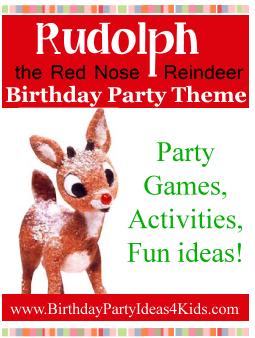 Fun party games, activities and fun ideas for a Rudolf the Red Nose Reindeer party. Great for holiday parties for kids, tweens and teens. Teams can only use the icebergs given to them to get from one end of the room to the other. Teams use the iceberg pieces to move by having players stand on the ice burgs all together. Then they take the back iceberg and hand it down the line to the front of the line and so on. If a player steps off the iceberg into the water they all go back and begin again. Supply each player with a bowl of red pompoms, Vaseline, and an empty bowl. The players must put Vaseline on their noses, then use their noses to transfer the red pompoms into the empty bowl. The player that transfers the most pompoms in under one minute wins. Glue red pompoms onto white ribbons, one for each player. The players put Vaseline on their noses and put their ribbon in their mouth so the pompom hangs down. The players then must flip their heads and try to get the pompom to stick on their nose, no hands allowed! The players who get the pompom to stick five times in a minute wins! Divide party players into two or three teams and give each team a bag of balloons and a pair of pantyhose. The teams must blow up balloons and stuff them into pair of pantyhose. When the team feels their pantyhose antlers are complete, one person from the team puts on the pantyhose. The team with the best antlers wins!